Actually no complete Egyptian version of the stories has survived from ancient times, and the earliest version was written down by Plutarch, a Greek traveler and historian of the first century after Christ. For the next four hundred years, other Western writers such as Diodorus Siculus, Firmicus Maternus, and Macrobius recounted the adventures of the two gods and added details of their own to the stories. Much of this non-Egyptian material has been confirmed as authentic by Egyptologists working in temples and other sites where murals tell fragmented stories of the divine pair. Finally, the Pyramid Texts and other early writings contain numerous references to Osiris God and Isis and help complete the story when pieced together. What is told here is a compilation of these sources, but Plutarch’s writings provide the basic outline. Osiris God , while in human form, was first a legendary leader of mortals. At the moment of his birth a voice announced: “The lord of all the world is born.” Other supernatural signs pointed to the occurrence of a marvelous event, especially at a temple at Thebes where a man named Pamyles had gone to draw a jug of water. He heard a voice commanding him to go forth among the people proclaiming that “the good and great King Osiris God was then born.” Having fulfilled his charge, Pamyles was rewarded by the grateful gods by being given the responsibility for Osiris’ education. Osiris God was born a god but grew up as a man. He became king of Egypt at a time when the country was full of wild men who knew only the habits of barbarism (including cannibalism, according to some versions of the myth). As a civilizing force for these people, Osiris God discovered methods of organized agriculture and taught his people how to cultivate corn and barley. He was the first man to drink wine and showed his people how to plant vines to provide grapes for this remarkable new beverage. In order to refine their rough customs, Osiris God instructed the citizens of his land in rituals for honoring the gods, and gave them laws to govern their behavior. He relied heavily on the advice of Thoth who taught human beings rhetoric and names for objects that heretofore had been nameless. Thoth invented the letters of the alphabet, arithmetic, music, sculpture, and astronomy-gifts that Osiris God passed on to humans for their betterment. The people recognized that Osiris was responsible for improving their lives and greatly revered his ideas. Satisfied with his progress at home, Osiris God decided to export his civilization to other lands. First, he arranged for Isis to govern Egypt while he was gone and gave her Thoth as assistant. Then, he marched toward Ethiopia with an army and a few friends. Greeted by a company of satyrs for his entertainment, he added musicians and dancers to their numbers. He taught the local inhabitants agricultural methods, constructed dams and canals to control the flooding of the Nile, and built cities. In areas too dry t grow grapes, he taught the people to make beer from barley. He then passed through Arabia on his way to India, where he built cities and introduced the ivy plant. Next he traveled across the Hellespont into Europe where he was forced to kill a king who resisted his new and fair system of government. 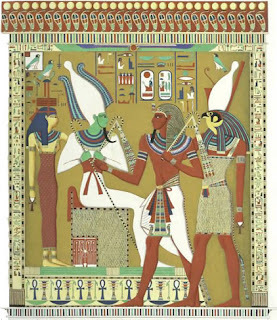 During his absence Isis had no serious problems since she was careful and cautious, but Seth, their brother, was jealous of Osiris God ’ success, his land, and his wife. He bided his time and plotted the assassination of the king. He gathered around him seventy-tw0 conspirators and convinced Aso, a queen of Ethiopia who presumably was jealous of Osiris God ’ success in her country, to join the plot. The hypocritical conspirators greeted their king with smiles when he returned home, but in their hearts they were plotting murder. Seth, who had secretly taken the measurements of Osiris God ’ body, constructed a fine chest to fit those measurements exactly. This richly decorated wooden box was a prize worthy of any man or god. At a feast at Seth’s banquet hall, the guests drank wine and sang songs while slaves scattered flowers about the room. At the height of the entertainment, the chest was carried in while the guests cried out in appreciation of its beauty. With words sweet as honey, Seth told those gathered there: “He who lies down in this coffin and whom it fits, to that man I will give it.” The guests eagerly stepped forward, but each found that it was not the right size. When all the others had failed to fit the chest, Seth jokingly challenged the king to try. Proudly Osiris stepped into the chest and lay down to discover that it was a perfect fit, but no sooner was he inside than the conspirators slammed the lid over his head. While some nailed the top tight, others poured hot lead around the edge so that Osiris God quickly suffocated. The party guests then took the chest to the Nile and threw it with its divine contents into the waters, which carried them far away.